Kauai is undoubtedly the most lush, green, and tropical Island in all of Hawaii, making a Helicopter Tour of Kauai, a must for the adventurous traveler. 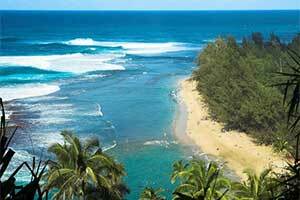 The Island’s impressive scenery has made Kauai famous in movies such as King Kong, South Pacific, and Jurassic Park. 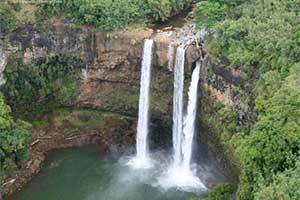 Its stunning beauty, and the fact that about 65 percent of Kauai is inaccessible by car, has made helicopter tours one of the most popular vacation activities on the Island. Blue Hawaiian Helicopters’ Kauai Eco-Adventure air tour begins with a flight to spectacular Hanapepe Valley, continuing on to Mana Waiapuna, commonly referred to as “Jurassic Park Falls.” Fly up the Olokele Canyon before moving on to Waimea Canyon, the famed “Grand Canyon of the Pacific.” Then, the sculptural masterpiece of the Na Pali Coast gives way to the Bali Hai Cliffs, and the pristine blue waters of Hanalei Bay and the Princeville Resort area. Finally, weather permitting, approach the crowning glory of the Garden Isle: Mount Waialeale, the wettest spot on earth, with an average rainfall of 450-500 inches annually! Flying into the center of the crater with its 5000-foot walls towering above and its 3000-foot waterfalls, is a truly awe-inspiring finish to the Blue Hawaiian ECO Adventure over the Garden Isle. Blue Hawaiian Helicopters was founded in 1985 and, with operations on all major Hawaiian Islands, it has grown to be the largest air tour operator in the state. Blue Hawaiian has been awarded the FAA’s coveted “Diamond Certificate of Excellence” every year since 1998, and has received the “Star Diamond Award for Outstanding Quality” since 1995. Blue Hawaiian Helicopters on Kauai are proud of their expert pilots who average well over 10,000 hours of flight time and twenty years in service. Each is a Hawaii State Certified Tour Guide, expert on the rich history and culture of the Islands, and eager to share their knowledge with guests. Flights feature Bose aviation-grade noise-canceling headsets, 4-camera digital DVD in-flight recording (available for purchase), and two-way communication between you and your state-certified pilot. Blue Hawaiian Helicopter Tour Info – CLICK HERE! Sunshine Helicopter’s Ultimate Kauai Adventure Helicopter Tour departs from Lihue Airport and takes in Waimea Canyon, Mount Waialeale,Wailua Falls and the breathtaking Na Pali Coastline. On this helicopter adventure you will see lush valleys dotted with waterfalls, colorful and intricate Waimea Canyon and the impenetrable Na Pali coast known for its towering razor sharp cliffs and secluded beaches and much more. 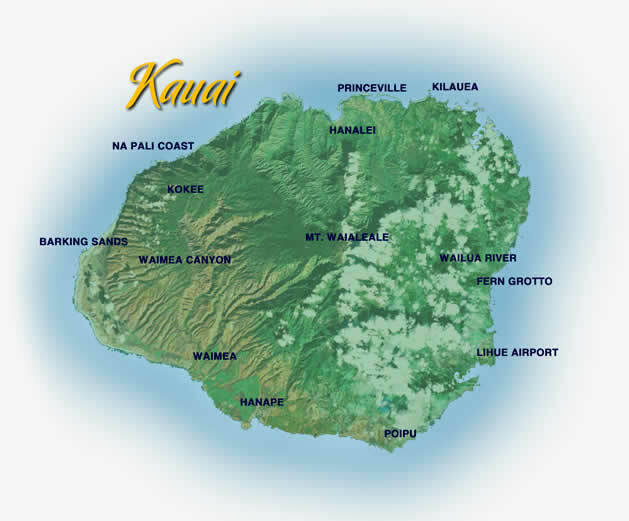 The tour is choreographed with island music and your experienced pilot will share fascinating legends and history of Kauai. In addition to the breathtaking visual experience of flying over beautiful Kauai, you’ll also come away with a new understanding of this idyllic tropical island! Sunshine Helicopters flights offer spectacular aerial views — dense tropical rainforests, vibrant green valleys, and even the chance to hover next to towering, plunging waterfalls! Soar by the world famous sea cliffs of Na Pali, and witness Hawaiian wonders up close. With over 90% of the State of Hawaii being accessible only by helicopter, this is one way to truly get an intimate glimpse of the unmatched grandeur of Hawaii’s oldest island! Private charters are also available for up to 6 passengers. Will Squyres Sunshine Helicopter Tour Info – CLICK HERE!